This was during the safety car for the Sergio Perez crash. Fernando Alonso was leading and I saw him holding up the pack as the safety car went by, he’d put his foot on the brake and was going slowly. I thought, ‘uh oh, this could be a big shunt’ because they are coming down that hill into that corner. Obviously there wasn’t a crash, but it was very close behind him. It was nice to get a shot of Alonso leading as it’s rare to see a red car out in front this season. It’s amazing how a bit of rain and a few incidents can cause the field to be mixed round so drastically. Rain and those sort of things create quite a good spectacle, that’s what you need every now and then to spice things up. Bernie had the thought of sprinklers a while ago but that might have been a step too far! Camera model: Nikon D4 | Exposure time: 1/250s | Aperture: F5 | ISO speed: 1000 | Lens: 500mm Telephoto. I haven’t been in many press conferences this season to take photos, but when I do go there it always seems to kick off! Friday at the Hungaroring was no exception and Christian Horner became quite animated and outspoken when he was asked about the politics behind some of F1’s future venues. I think he was getting bored of the questions to be honest, and it was all very political, which the teams don’t really like. They don’t like to stand politically for or against anything because they are governed by the FIA and FOM, so I can understand why Christian didn’t want to talk about it. However, he probably knows more than most people because he is close to Bernie Ecclestone and in charge of one of the top teams. He was waving his hands everywhere and gesticulating, which is great for pictures. We don’t want someone sat there with their arms crossed because it makes for boring photos. Team bosses folding their arms is a bit of an old trick if they want to stop themselves giving away too much in body language, but Christian certainly wasn’t holding back. I saw this because I was in the prime position for the podium, I managed to get high up and swung round to see who was in the crowd. There were people running down the track and the pit lane so you’re always looking for celebrities or people for a good shot. You’re just looking to see who is there. They’re obviously going to be looking up towards where we are as it’s literally next to the podium so it’s a good spot. I saw Horner and Geri Halliwell and thought I don’t have any pictures of them yet. The picture is made by Adrian Newey being there with his girlfriend Amanda as well. I did tweet this picture and Geri replied back saying ‘Ha Ha Ha’ – she probably thought she was a bit incognito here but I spotted her! When you’re in a crowd of 200 or 300 people you don’t see anybody, but when you’re up above looking down it’s easier. At this point I’m trying to shoot the podium as well so there’s no time to stop and dwell on a shot. I think they’ve tried to keep this a bit low key but now it seems to be a bit more in the open. Geri keeps herself very discreet though, I don’t think they arrive or leave together – they keep themselves to themselves which is fine! I thought I would take the fisheye because I knew I would be up at this point, the same place I took the Halliwell shots from. I actually took every lens with me. I didn’t quite know when to use the fisheye because you don’t want to overdo it, I just wanted to use it once. I thought when Daniel Ricciardo came on the podium was a good opportunity because I had to a choose a moment. As it turns out he’s got his arm in the air which is great. For this I’m leant right over the wall so you don’t get the wall in it! This has everything you can’t really get on a wide-angle lens – fisheye gives it a more atmospheric feel. This is looking back from the podium view and I think it makes it a great picture. I was in a really perfect spot, there was only three of us there. You can shoot from the other side of the podium through the glass but you obviously run the risk of a reflection. It’s very rare to get an opportunity for this kind of shot when you look at the remaining races; it won’t happen in Belgium, at Monza it goes over the track. I could see it without anyone blocking me or anyone getting in the way. As the drivers left the podium we shouted down and he was happy to do this. It’s almost looking down on him. I got Fernando to do it as well, but he wasn’t looking up as much as Daniel. Rather than just leaving the podium it gives us a proper podium tyre shot. It’s shot in quite a long lens, I think this is 70-200mm, so you are quite governed by where he’s going to be and what he’s going to do. He’s always up for it though, Daniel, and his smile really makes the podium at the moment because it’s fantastic. For constant pictures to have someone smiling that often really is a plus for us. This was on Friday night. I think it works here because it’s like the sun setting on the first half of the season. We were working quite late in the pits, with the sun going down there’s a really nice light on brakes and people working on the cars. Hungary is one of the best places for this. It’s a great place to shoot the grid girls and the guys working on the cars, who are pepping them in parc ferme. This is good because we can go down the pit lane at any point in the evening – the only thing we don’t get access to is support races! We need special tabards to cover anything non-F1. This is actually shot on track from the opening where you can walk from the pits to the starting grid. There’s the silhouette of the lights and the grandstand, it looks really good. The sun did this every evening, actually, it looked really scenic and provided quite a different view of a grandstand than we’re used to seeing. Camera model: Nikon D4 | Exposure time: 1/250s | Aperture: F6.3 | ISO speed: 4000 | Lens: 70-200mm zoom. The first one of Lewis is from Saturday morning. Working on your own can be tough, trying to get through 11 teams, but sometimes it works really well. As I’ve said before it’s all about creating a set of pictures to tell a story and him sitting in the garage is great for this. In this particular moment I was lucky as he sat here for quite a while without any mechanics around him, so to get a picture that clean is very rare. It creates a good picture, to be honest. The picture of him and Toto is nice as well, though there is actually a mechanics arm in the corner but I was governed by the smaller lens from the earlier shot. Both of them are really nice for pre-session shots. This is a classic, isn’t it. This is obviously the initial dash onto the track and there was a few people racing to get this sign. I was just taking general shots of the run on to the track and then this happened, it adds something to a shot which would have already been quite nice. I don’t know what he did with this, he can’t exactly put it in his pocket, I’m sure he would have had it taken off him. It’s too obvious! This has Santander on the back of it so I don’t know whether they would just replace it or not. The running onto the track was reminiscent of the Schumacher days, albeit probably a bit less intense. There’s a really nice mix of people; Germans, Brits, Finns, Swedes, coming onto the track, so it makes for a really good shot. There’s a funny story to this one – or rather a sad story, from my point of view. I missed most of it and even in this shot there is someone’s head in the corner. The facilities at Hockenheim are reasonably good and I can understand that they seal all the fences for safety reasons, but it is frustrating to get to the first corner with stickers for agencies to stake out their place before we arrive. Safety is important but we also have to work, at the end of the day, so it’s tough. You’re never going to get more than ten people through that gap and I thought if anything does happened at the start, I’m stuffed. And then that happened! I just heard the crash, bang, wallop, turned left and this is what I got. Some people on the front row did get it but people on the second row where I was, didn’t get it all. It’s down to the facility rather than my personal skill, there’s not enough room and you’re shooting above people’s heads which is annoying. In the end when you put all the ones together we got it made a nice sequence but from my point of view I felt we were let down a bit from a working point of view. I prefer this version of the drivers parade to them all standing on the truck. The drivers hate it, to tell you the truth, because they’re on their own and can only speak to the driver – but they can barely hear him. That means they have to wave for the whole lap and it’s probably quite boring for them. But it’s great, they go round in these classic cars and it’s what they should be doing, not talking to each other on the track. This is a nice shot because it’s atmospheric; you can see the classic cars, the crowd, the drivers. That part of the stadium was quite busy. It’s a classic old German stadium and it works really well – if you look closely you can see them doing a Mexican wave. It’s empty down the front but the view at the back is better. Come on Sutton, work it! These are some of Nico’s friends I’ve become acquainted to over the last few years. One of them is an artist and the other two are just close friends of Nico. We did a shot from the TV compound and I was just going to do the team shot, saw these guys and though I’d get a shot in the bag. I was trying to get Nico to put his thumbs up. Nico was getting really into it, he’s actually saying “Come on Sutton, work it! Work it!” We did it once without the trophy, and then he grabbed the trophy and we did it again. Nico was loving it and so were his friends. It’s nice to get some appreciation from the drivers. 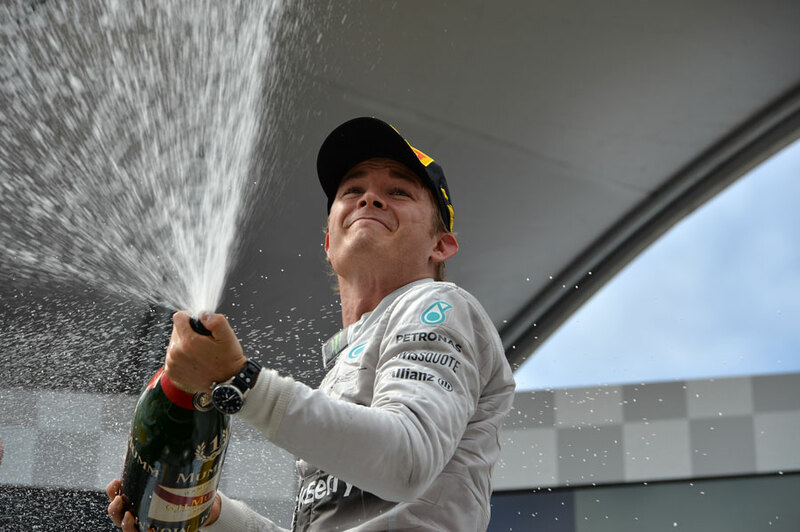 Nico is always really good with us in a way we don’t always get from Lewis, for example. I know Nico from his Formula 3 and Formula BMW days, we’ve grown up with a lot of the drivers I suppose. At least he knows my name! He probably doesn’t know my first name but it’s nice that he knows my surname, it is nice for us photographers to get some recognition like that. This is a good shot from Friday practice. Kamui Kobayashi came past me with a load of smoke coming out of his car so I was doing a pan shot with the empty grandstands, as they are nicely coloured. So during practice they make for a nice picture with no-one there. When I saw the fire in the back of it I changed to a bigger lens, the 500, but he’d already stopped by then. The extinguishers came out and then he jumped out in the air, I couldn’t believe how high he jumped! It’s obviously to do with the KERS but it looks like he’s jumping about six foot in the air. I don’t know why he was jumping so high but it made for a great image, again. Then the fire wouldn’t go out, when they put it on the crane it was still smoking so Kobayashi got the extinguisher himself and started trying to put things out. Again, this one if being in the right place at the right time. If I had been here for qualifying I would have got Lewis’ crash but I was elsewhere on track, which is sod’s law! The drivers and teams of the Formula One world have again supported the annual StarCards F1 charity auction, supporting Great Ormond Street Children’s Hospital in London. These world famous auctions have been supported by Sutton Images since 2004 and continue to raise thousands of pounds for the charity. Mark Sutton has supported the fundraising event by obtaining the signatures of the 2014 F1 drivers on Great Ormond Street Hospital playing cards, t shirt and 2014 signed grid photo from every driver. In a special tribute to Formula legend Michael Schumacher who has supported the cause over the last 10 years a very special signed 7 of Hearts represents Michael’s achievements as a seven-time Formula One (F1) World Champion. The auction starts at 8pm on the 30th June at www.starcards.org during the British Grand Prix period and ends 10 days later at 8pm on the 10th July. For more information contact: Paul Brett, StarCards Press office. Red Bull did an amazing job getting a bunch of old cars together and filling the cockpits with drivers of a similar vintage. 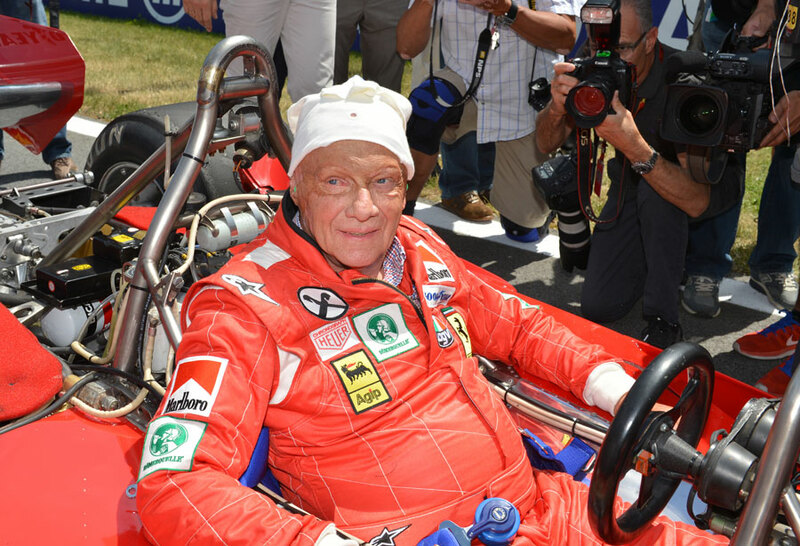 Niki Lauda was in his Ferrari 312T2 and it was great to see him out on track for a few laps before the race alongside other old Austrian drivers, including Gerhard Berger and Helmut Marko. It was a great spectacle and they went out on Saturday night and again on Sunday before the race. 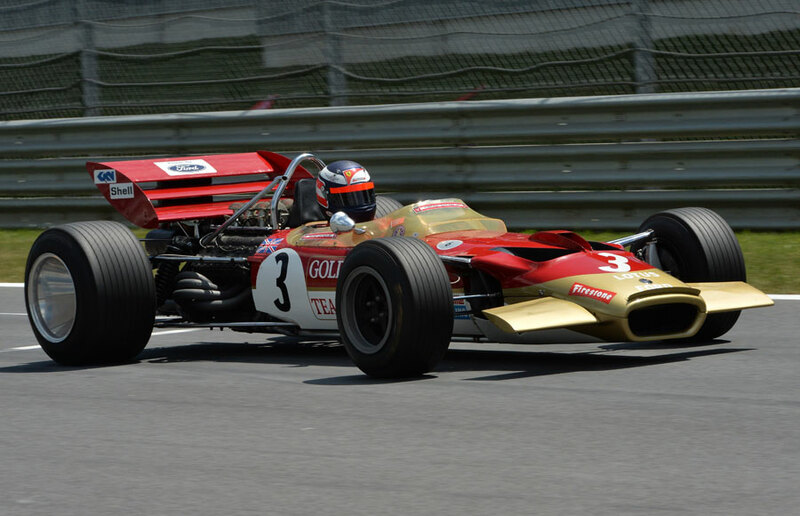 Berger was in Jochen Rindt’s beautiful Lotus 49 but struggled to get out of the narrow cockpit opening when he stopped on the grid! It was great to see them all back in their overalls, even if they were a bit tighter than in the old days! I think having the classic cars at grands prix is great because the fans love them and they provide that raw sound that is missing this year. 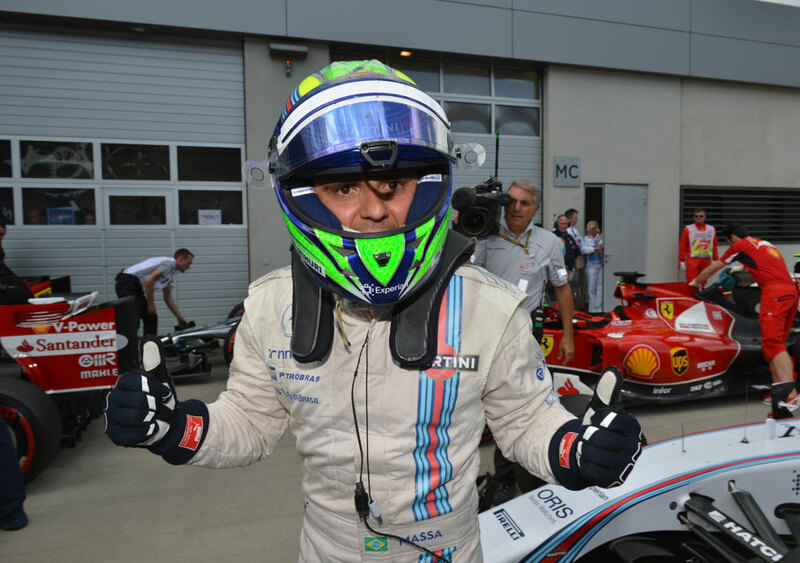 This was quite special, but when we were waiting in parc ferme we didn’t know Felipe Massa had secured pole position so it was quite a surprise when he arrived and started celebrating. They were quick all weekend and it was a special thing to see them take the front row. He was looking right at me in this photo and pumping his fists, so it really gets the across the raw emotion of his first pole since Brazil 2008. People have said that Pat Symonds has created a good vibe in the team on the technical side and in Austria we really saw that start to pay off. This photo just shows you the support of the fans as early as Thursday. 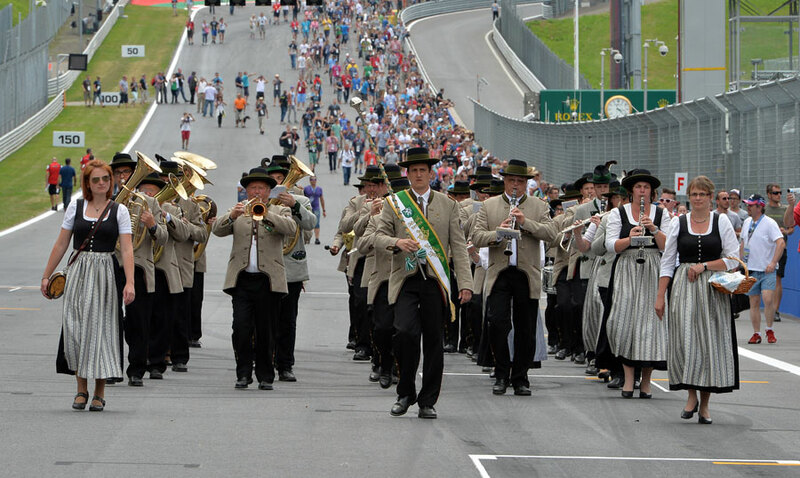 They are being led by the band and as they went into the pit lane it got a lot narrower and there was nearly a scene from a comedy film as they all got squashed together and nearly fell over themselves. But there was amazing support from all the fans and even on Sunday morning I thought I’d got in early and the stands were already chock-a-block. It was great to see and shows how much support there is from fans in Europe. I think we’ll see it in Silverstone as well as there is a pit walk there this year for the first time. 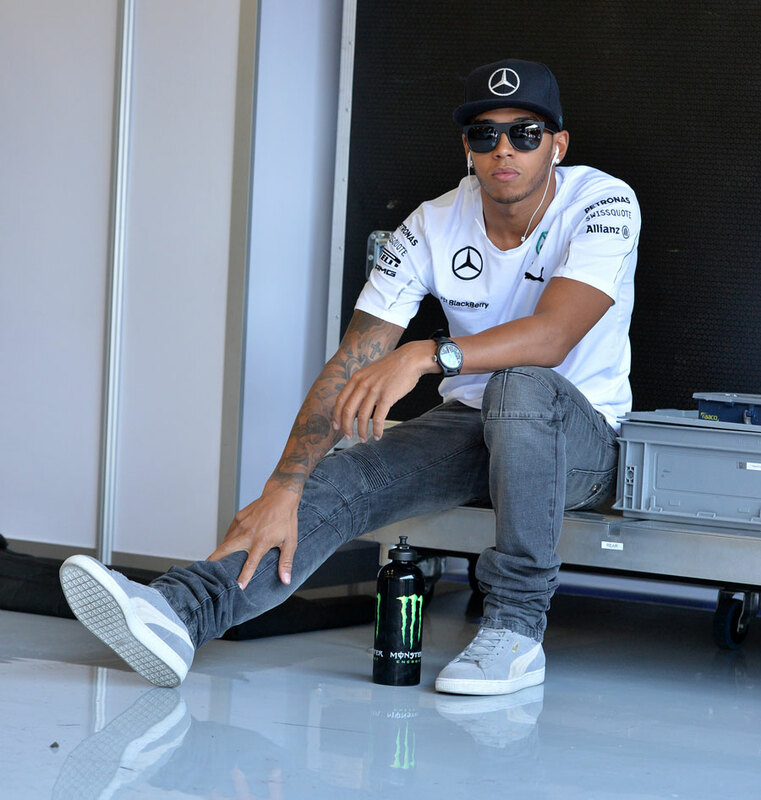 This was taken before the drivers’ parade and Lewis Hamilton was just sat waiting by himself. To the left, out of shot, all the other drivers were talking to each other, but Lewis was just sat there by himself in his own little world. It’s not as if he blanks himself from the other drivers all the time, but in this moment he seemed to want to be just by himself with his music and away from any distractions. But the intention was just to get a nice picture of him by himself relaxing. I’d just taken the photo of parc ferme as the drivers got out the car after of the race and celebrated, and because it’s away from the podium, I thought I’d stay where I was and not bother with the traditional podium shot. Instead I saw the team there and thought I’d get this picture of the team celebrating. In order to show the depth of the crowd I just pre-focused and held the camera up above my head, otherwise you just get the people at the front. You can see all the smiling faces and the fist pumping – it is just real emotion. I know there’s no team bosses in the photo, but I think it’s great to show the mechanics and all the other members of the team who so such a great job at each race. So after taking the picture of the team, I was directly under the podium. 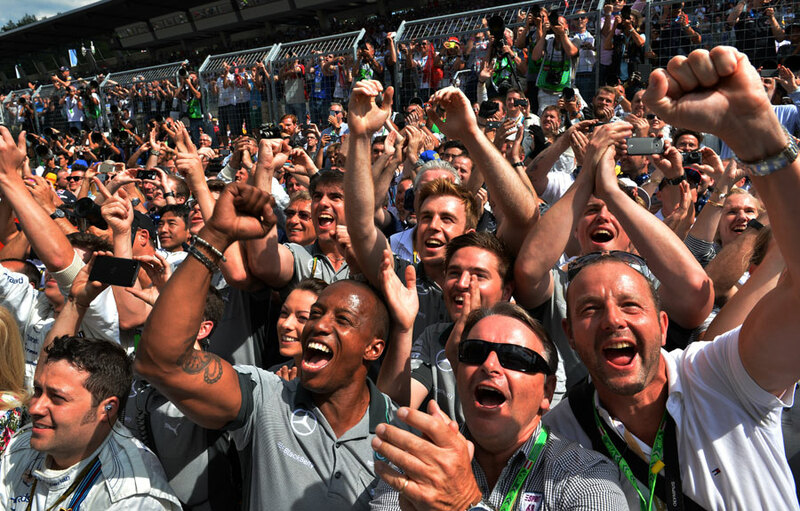 I thought I wouldn’t see anything from there, but by chance Nico Rosberg came forward above my head and started spraying the champagne at the team behind me. It’s a really clean photo with none of the sponsors you usually get on podium photos, so you can sell it to anybody. I didn’t expect to get this photo because of my position, to be honest, so it was great to get something so good from nothing.